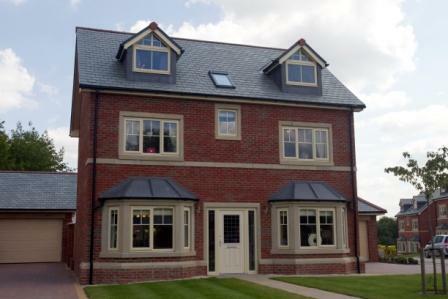 Change colour of PVCu windows – Coloured PVCu windows are becoming increasingly popular but there is a price premium for them and this can be as much as 30% of the cost of standard white PVCu windows. But what if your your existing PVCu windows were white and you would like them to be coloured? A complete replacement of your PVCu windows would be expensive but now you can have your own PVCu windows brightened up in a wide choice of colours. BUY THEM ALREADY COLOURED – Once the PVCu profiles are extruded (the bar lengths of PVCu which are cut to size and then welded together to form window frames) they are foiled. This is the same process involved in creating woodgrain effect PVCu window profiles by bonding a very thin coloured and grained foil to the face of the bar lengths. The coloured foil can be bonded to just the outside or to both inside and outside of the PVCu window frames. The advantages of this method are that the foil is quite robust, UV stable and the grain helps to replicate painted timber frames. However, due to the cost and method of manufacture, most suppliers have a very limited colour range – normally including green, blue, black, cream and red. PAINTING PVCu WINDOW FRAMES – The second method to change colour of existing PVCu windows is to paint the PVCu window frames, and this can be done after they have been installed. This finally gives homeowners with plain white PVCu window frames the chance to change colour of existing PVCu windows, even though the colours are flat rather than grained. For decades we have taken for granted that wooden window frames can be painted, indeed need to be painted, but only relatively recently have paints been developed that bond to PVCu so well that credible guarantees can be offered. The main supplier for coloured paints which have been specifically manufactured for PVCu windows is Technispray Paints Limited™ which supplies Kolorbond®. Kolorbond® is available in virtually any colour you could think of. The basic range follows the colouring system known as the RAL® range which was developed to avoid the problem of architects and product specifiers ending up with the wrong colour blue for example. RAL Classic® colour 4-digit references have been an accepted format for colour definition since 1927 and they are used by institutions throughout the world to define and identify particular colours exactly, without having to exchange product samples. The Kolorbond® range of RAL® coloured PVCu paints includes 155 standard colours available in matt, satin or gloss finishes. How much does it cost to change colour of existing PVCu windows? The process of spray painting your existing PVCu window frames is extremely time-consuming. The areas around the frames have to be protected from the paint, the frames chemically cleaned to remove dirt, grease and possibly moss removed and three coats of paint are applied over a two day period. Nevertheless the cost of changing the outside colour of a few white PVCu windows would be from around £1,000. This is probably less than the additional cost over plain white PVCu windows, of having them installed as coloured frames in the first place. And once your tired, plain white PVCu windows have been professionally coloured, your neighbours will be convinced that you have had new ones installed. You can also change the colour of your existing white PVCu doors and change the colour of your white PVCu conservatory or orangery.